The Rosetta Stone was discovered in Egypt in the late eighteenth century, inscribed with ancient Egyptian hieroglyphics and a translation of them into Greek. The stone proved to be the key to understanding Egyptian writing. Today we use the term to mean, a clue, breakthrough, or discovery that provides crucial knowledge for the solving of a puzzle or problem. Learning objectives are the Rosetta Stone of ISD because they solve the puzzle of how to progress through a systematic approach to training. The original discoverer of the stone had a goal in mind; and goals vary. So is the case in the arena of ISD. The use of an objective depends who is using it. Objectives solves the “How” to take the results of an analysis to making decisions about choosing an instructional method and provides the tool to constructing a valid evaluation instrument. For the instructional designer, an objective should be a meticulously developed statement based on a task selected for training from an analysis that describes the desired behavior (action verb), conditions, and achievement criteria of a desired student performance (mastery). Objective solves the “What” is this session all about. It is the key to awakening previous knowledge on the topic, provides guidance on choosing a learning strategy, and establishes a clear endpoint for successful completion. In addition, objectives allow the learner to make a judgment regarding the value of the session; influencing the level of motivation to apply. The general principle of sharing the learning objectives with the learner is a sound one. Unfortunately, some historical events have yielded a poor practice; sharing a list of objectives written for the instructional designer at the beginning of a course. Let’s face it there is nothing motivating about reading or listening to someone read off a litany of objectives that can’t be understood. This method may actually interfere with learning. There are multiple sources that will bear out the following; although I think Smith & Ragan (1) say it best, “Only rarely will designers express the objective to the learners in the same forms that were used when designing instruction”. Objectives shared with the learner should be understandable by the uninitiated, shared prior to the related content, and describe how success will be achieved. Quick Quality Check: Ensure terms that have not been learned yet are excluded from the objective shared with students. Ask an inexperienced person to explain what will be learned and a description of how they would go about achieving success. Challenge: Choose a lesson and delete the list of learning objectives at the beginning of a learning session. If not already existing, replace it with a goal statement describing how the content will be applied. 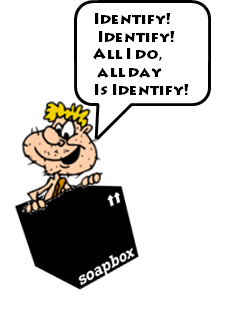 In my opinion, there is an overuse of the action verb “identify”. Recently as part of a group we were brainstorming some instructional methodologies. In reviewing the objectives; eleven of fifteen objectives used the action verb “identify”. Humans identify something by using our senses; generally our vision. Examples from the course we were reviewing: Identify a: method, route, components, limits, strategies … and the list goes on. Unless you’re some type of bio-robot doing a quality check as objects pass by, most of us don’t stand around and identify stuff. I submit there might be a bit of confusion with some knowledge of factual information required to accomplish a task and gets interpreted as the ability to identify it. The task may be to apply a method, choose a route, operate a component or adhere to a limit. The concern is that if you are focusing on the wrong tasks your training will be valueless on the job. Review the objectives for one of your learning sessions, select the objectives using the action verb “identify” and do the following reality check. Ask yourself, if this really the action you anticipate the learner to do in the work place. Follow this up with a review of the evaluation; is the verb in the evaluation congruent with the verb in the objective and task? The quality of your evaluation instrument is directly dependent on the degree of agreement between the action verbs in your objectives and the actions in the evaluation used to measure the mastery of the objective. The verb in the task statement and the verb in the objective should be the consistent. The verb in the objective and the verb in the evaluation instrument (read test question) should be congruent. 1) Smith, P. L. & Ragan, T. J. (1993) Instructional Design. Upper Saddle River, NJ. Prentice-Hall. 2) DOE-HDBK-1200-97, Guide to Good Practices for Developing Learning Objectives. 3) Beck R. A. (1982). Criterion-Referenced Measurement: The State of the Art. Baltimore, Maryland: John Hopkins. This was very informative. I encourage further articles on this topic! Clever way to "hide" the answer also...2 thumbs up! I often have a problem with the verb in the analysis being at the application level, e.g. apply a limit, but the customer wont' support an application type training or evaluation, only a knowleedge based training/evaluation, such as an instructor led class. So while the REAL objective may be to apply the limit on the job the objecitve in the class is to be able to pick out (identify) the limit from a choice of lmits in a test question. This method is used most often because designing an in class application test question takes too long and may often be subjective to grade. Sounds like your training to meet a requirement not providing the training that is required. This is sad on many levels. First, since you know the content is “bull…” how do you get your heart into it? The students will see it as “bull… “since it is worthless and they won’t get into it. The customer knows it’s “bull…” and as soon as they can cut that training it will happen in a New York minute. I don’t see any winners here. There is a saying; Good training is expensive. Poor training is even more expensive. Besides the loss of productivity because the students didn’t get what they needed and have to go learn it (not because of us, but in spite of us) there is the potential they do something wrong and someone suffers, or something gets broken. That being shared, the reality of things is mentioned in the Post on When Worlds Collide. Unless you can convince your customer differently, you make the best of it. It is not a perfect world. I hope the next post on objectives will help you with your problem in choosing the verb.